Nowadays, it is difficult to step out of your premise without checking the weather updates since weather changes are sudden and can be a great obstacle to your work schedule. People having big travelling plans need advanced system to predict weather conditions so that they can save the damage as much as possible. This is why having a weather app is must. Weather apps are a true savior and must be installed on your device as an essential resort required for checking the everyday weather conditions. Thankfully, both Google Play and iOS App store are packed with different types of weather apps that inform the users with real-time updates. After trying a number of apps we have scooped up these best 13 weather apps for Android and iOS users. Dark Sky can be considered as one of the most recognized weather app because of its simplicity and accuracy. Due t its predictive ability to capture bad weather scenario to the last minute, Dark Sky makes for the best source of hyper local weather information. 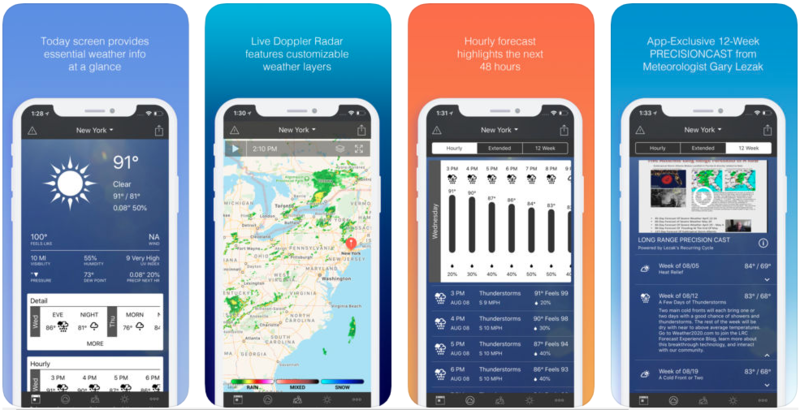 This app is very spontaneous in nature and it lets you access crucial information like weekly and hourly forecasts and interactive weather map. 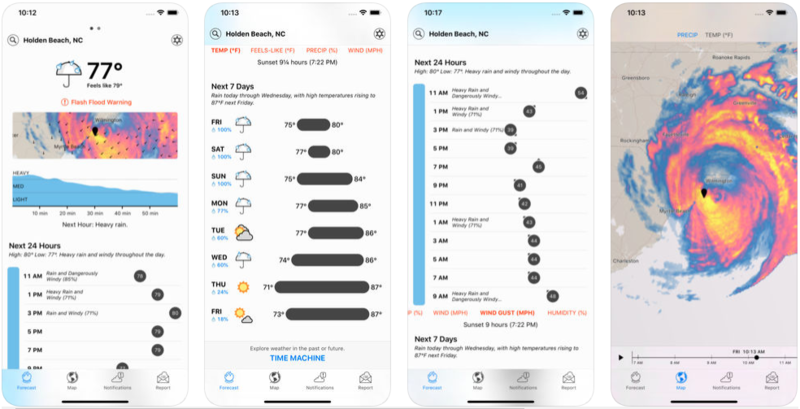 Dark Sky provides the option of “enlist your phone” by which periodic pressure data can be sent to the central database of the app which give forecasts in detail. This app offers all the necessary information one could ask for in a weather app. 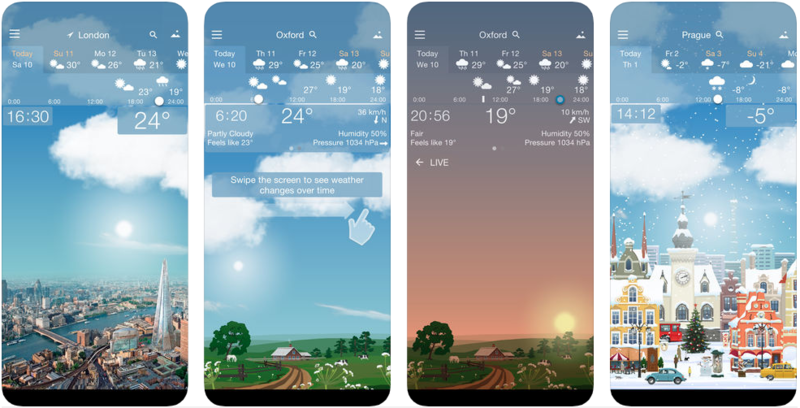 1Weather has a tabbed interface that lets the user to swipe right or left for viewing the forecasts, current conditions, precipitation tables, temperature graphs, interactive weather map, sunset/sunrise times and moon phases. The weather map in this app has the unique feature of 18 different overlays and the users can add overlays like radar, wind speed, clouds, hurricanes and wildfires. This app is mainly developed for the type of users that spends time outside due to necessity or pleasure. With the help of this app the users will have the idea about the weather and any event of rainstorm in advance. The specialty of RainAware is to give accurate predictions about the rainstorms. The interface of RainAware is quite simple in nature as it lets you access different windows such as weather forecasts and satellite imagery by clicking the tab options in the bottom. The usability of this app comes into handy when the user is outside and needs to check for any upcoming changes in the weather. This app can be considered as the prettiest of all weather apps as the features of this app is eye catching. As Yahoo is the owner of the photography site Flickr it is able to give various beautiful images of the cities with its present weather conditions. This app is not only about the looks as it provides weather data in the form of Yahoo Weather packs. The weather map of Yahoo Weather has the static overlays of the clouds, temperatures and present radar conditions. 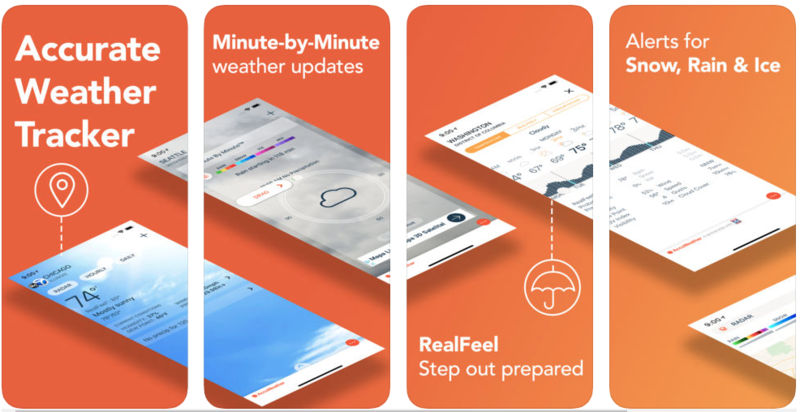 The features of this app is almost similar to the other apps but the interface of this app gives an interactive experience by providing an hourly view of the weather. This can be simply done by swiping right or left across the screen and the forecast will be displayed by an animated scene which includes sunset, sunrise, rain drops falling and sounds of birds chirping. The unique feature of this app is that you can select your own live wallpaper which can be customized. With the help of this app, exact weather data can be acquired by the users. This app provides all the weather related data that one could ask for. This app provides weather information of storms which are not useful for the regular users but can be used by the pilots of small planes to avoid turbulence. It can be useful for the users that live in hurricane prone zone for making emergency decisions. It is one of the costliest app which is mainly used by weather enthusiasts. The usability of this app is complex in nature and it has access to a lot of data which includes visual graphics and pie charts. This app contains a lot of information regarding weather updates as it gets the information from different weather stations and provides the necessary local information. It is by customization that the functionalities of this app can be arranged according to the preference of the users. 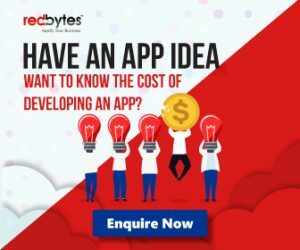 Each and every feature of this app can be modified by the user and the unnecessary features can be eliminated by the users. This app is free and ad-supported which is available on both iOS and Android. It provides meteorological data information of wind, temperature and an extended forecast of 10 days. The interactive map of this app displays Doppler radar data for the purpose of showing rainfall and other weather alerts. This app also has the features of uploading images, videos, photos and tweets. It has different tools that provide information to the users about wind speed, position of the clouds and UV index. This is an app which can be very useful in times of emergency. 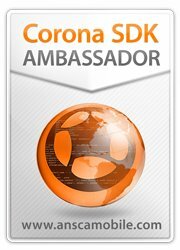 You can easily install it in your iPhone or Android device. A great initiative from the American Red Cross only for emergency purposes, this app mainly takes into account the severe weather conditions like floods, hurricanes, winter and heat storms. The Emergency monitors the living area of the users and can also be helpful in finding people and cities that are important for the user. The features of this app are customizable alerts and in case of emergencies it provides information about the nearest shelter to the user. The info graphic of this app is simple in nature and it has the same features as that of Weather Timeline. 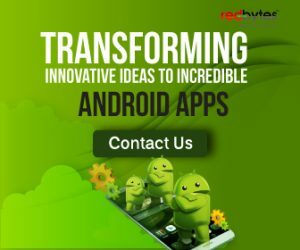 The design of this app is bright with bold colors which makes the interface readable and clear. 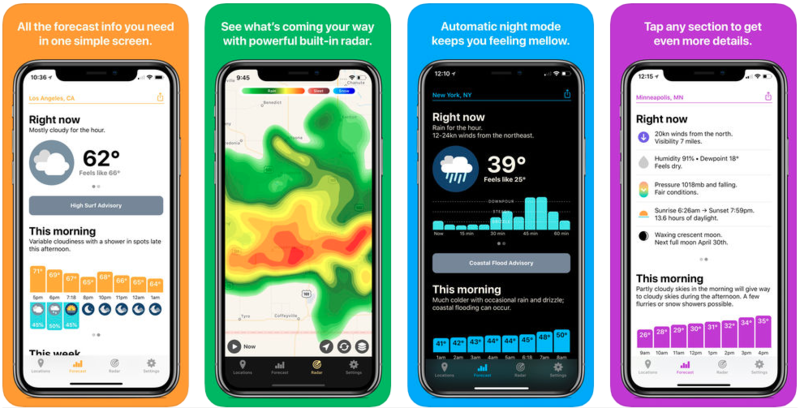 The forecast prediction of this app is powered by Dark Sky where the data is presented in clean icons and info graphics that can be easily accessed by the users. This app is ad-supported and free. This can be considered as an excellent app that provides hourly and daily weather updates. The users can easily integrate their calendar with this app for getting weather forecasts of 15 days. The MinuteCast feature of this app offers minute by minute hyper local forecasts for every two hours. The reach of AccuWeather is complete in nature and it provides forecast data of 3 million locations. Also, the app has alert features for severe weather conditions like thunderstorms, tornadoes, massive snowfall and high winds. 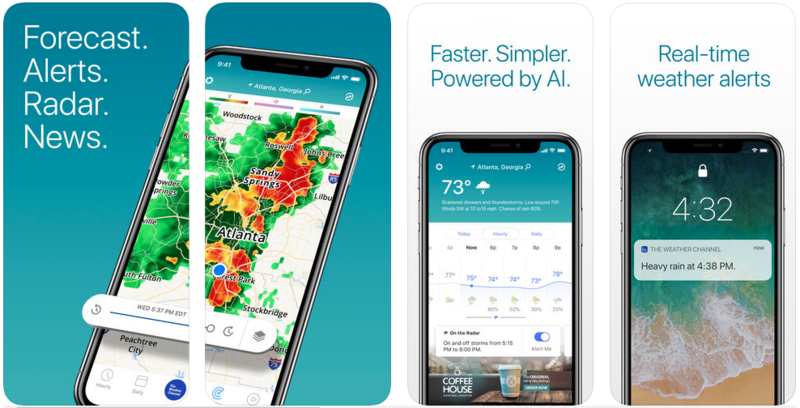 This is a free app that provides a lot of weather information to the users like fast alerts of severe weather conditions, lifestyle forecasts and accurate forecast data which are planned through GPS. The stunning features of this app are visual forecasts, interactive maps, weather alerts and live cameras in selected locations. The recently added feature in this app is Spark lightning proximity alerts. Weather can suddenly change and Apalon’s NOAA Radar Pro can provide emergency information of severe weather conditions. The interactive app map provides real time animated radar images along with detailed information about the weather conditions. The remarkable feature of this app is its ability to send notifications beforehand so that the user does not face any weather issues like flood warnings, snow storms and heat storms. These 13 best weather apps are most seriously considered by smartphone users due to its incredible capabilities and unique features. With these apps, you are sure you will never be left behind in knowing latest weather updates and can avoid potential hazardous situation. You can try one or two of from the list to test its power and effectiveness in your life. Let us know if we have missed out on including one of your favorite weather apps for Android and iOS devices.